​Scroll down for latest News and the Archive of events, exhibitions, publications, and workshops since the implementation of the paraecologist platform in 2011. Participants of the ARBONETH closing conference in Addis Ababa. The two ARBONETH paraecologists Sintayehu Tufa and Serawit Tassew from Wondo Genet attended the ARBONETH project closing conference held in Addis Ababa from the 30th November to the 1st of December 2018. Together with Seble Metaferia and Ute Schmiedel they gave an oral presentation on “The role of paraecologists in ARBONETH and other biodiversity projects”. 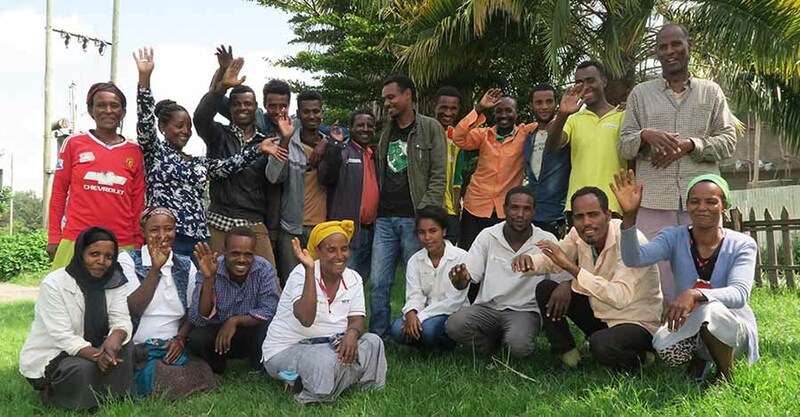 The ARBONETH project (www.arboneth.com) ​held the third training workshop for the two project paraecologists as well as for 19 workers from the plant nursery and the arboretum at the Wondo Genet College of Forestry and Natural Resources in southern Ethiopia. 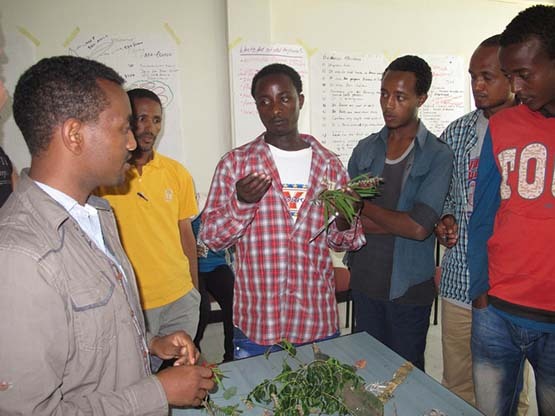 The workshop aimed to broaden the participants' understanding of plant propagation and cultivation techniques. Other aims of the workshop were to share local knowledge on useful plants, better understand of environmental conservation, the planning of activities with school children around the plant nursery or the arboretum as well as team building. The workshop was conducted by Ms. Seble Metaferia from Wondo Genet College, Ethiopia (far right in the picture) and Dr. Ute Schmiedel from Hamburg University, Germany. Reginald Christiaan, paraecologist from Soebatsfontein, South Africa, wins the Kudu Award "Youth in Conservation" from South African National Parks (SANParks) for his contribution to conservation through his scorpion project that raises awareness on the diversity and ecology of this understudied Arachnida fauna of the Namaqualand. 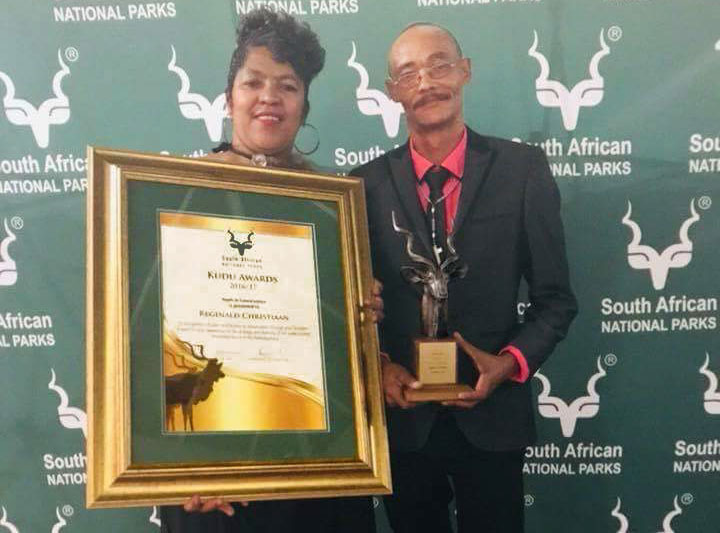 Ms. ​Angela Isaks, Park Manager of the Namaqua National Park​, and Mr. Reginald Christiaan at the 13th annual SANParks Kudu Awards ceremony at the CSIR Convention Centre in Pretoria. ​held a participatory training workshop for the two project paraecologists as well as for 19 horticulturists from the Wondo Genet College and from the neighbouring village. The workshop aimed to broaden the understanding of ecological processes that are relevant for plant propagation and cultivation. Other aims of the project were to deepen the understanding of horticultural techniques and reflect on challenges of giving and receiving instructions and of working in teams. 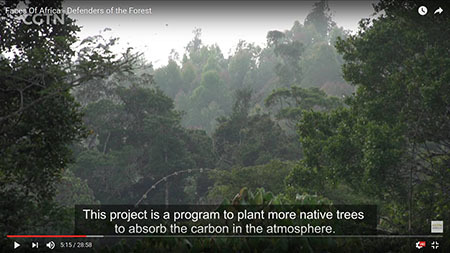 The film portrays the work of several members of the community-based Association Mitsinjo in Madagascar, including various aspects involving the association's paraecologists. The focus is on Justin Claude Rakotoarisoa, who is heading Mitsinjo's amphibian research and conservation activities. The film was produced for CCTV/CGTN and its series "Faces of Africa". 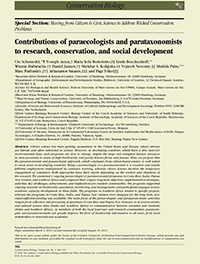 The review describes paraecologist and parataxonomist programmes in Costa Rica, India, Papua New Guinea and southern Africa and compares their origins, long-term objectives, implementation strategies, activities, key challenges, achievements, and implications for resident communities. The paper can be read and downloaded for free. 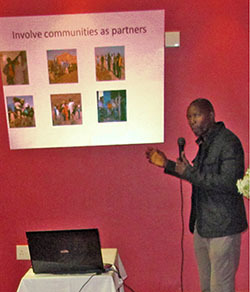 Sharing The Future Okavango Research Results. 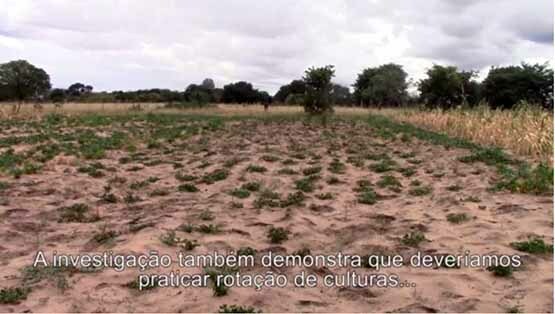 The video with English (https://vimeo.com/131449263) and Portuguese (https://vimeo.com/134558873) subtitles can now be viewed and downloaded freely from the internet. 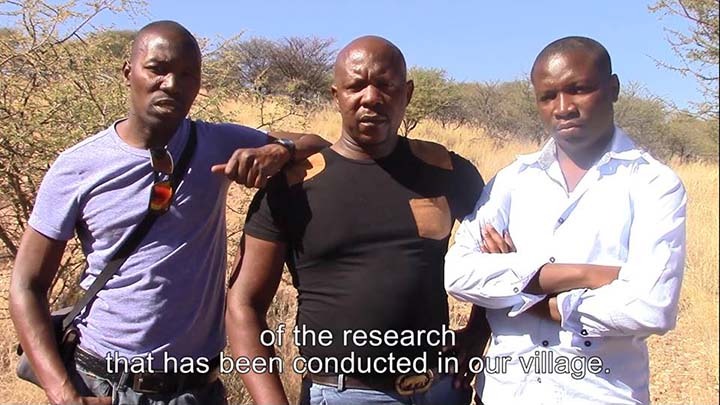 Miguel S. Hilario (Angola), Meshack Kwamovo (Botswana), and Robert Mukuya (Namibia) make the film Sharing The Future Okavango Research Results. Video still with Meshack Kwamov, Robert Mukuya, and Miguel Hilario. During the first half of 2015, the paraecologists of the Future Okavango Project produced a 20 min film where they translated outcomes of the research project into six land user-relevant messages. The footage has been shot at the three core research sites of the project, Cusseque in Angola, Mashare in Namibia and Seronga in Botswana. The languages used in the film are Portuguese, Rukwangali and Setswana with English and Portuguese subtitles. From 10th to the 20th of June, the paraecologists met in Windhoek to edit the film together with Martin Gruber, ethnofilm. The film will be launched mid of July and will be freely downloadable from the internet. 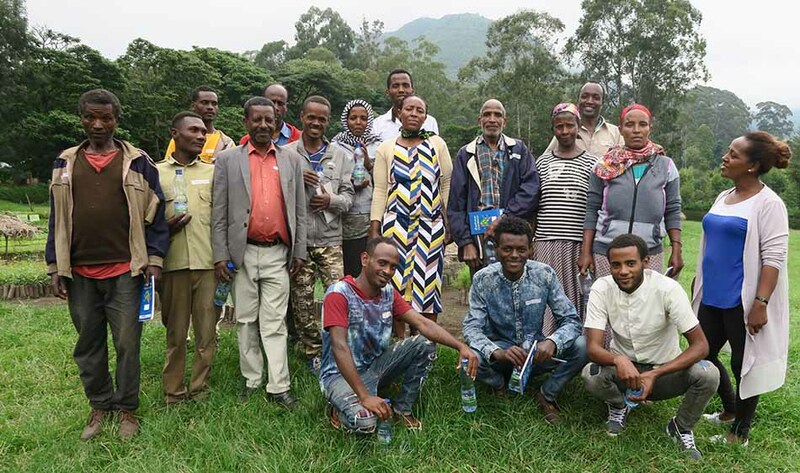 The DAAD-funded ARBONETH project conducted the second paraecologist training workshop at the Wondo Genet College for Forestry and Natural Resources of the Hawassa University, Ethiopia. From 17th to 26th of June, 22 trainees from the local rural communities will participate in the training workshop. Subsequently, two paraecologists will be selected, trained and involved in the project as paraecologists until end of 2018. Two staff members of the college will get continuous backstopping as mentors and trainers for these paraecologists. The training workshop was facilitated by Ute Schmiedel (University of Hamburg), Seble Metaferia (Wondo Genet College), Sintayehu Tamene (Wondo Genet College), Justin Donnelley (Peace Corp Ethiopia). 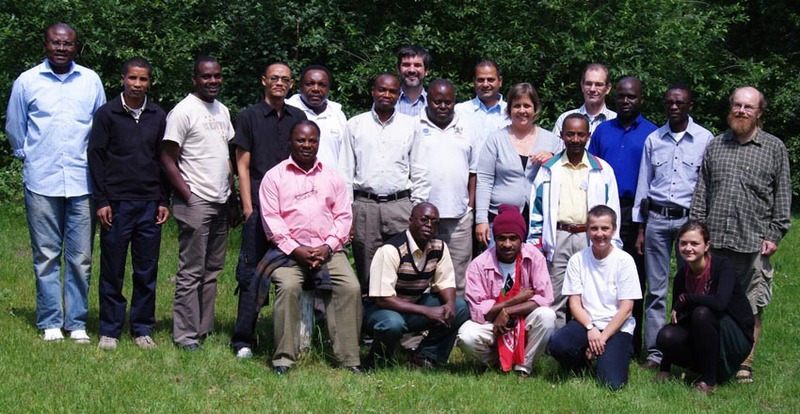 Participants of the second paraecologist training workshop in Wondo Genet in June 2015. Back: Zenebe Tefera, Zenebe Zerihun, Shallo Kufa, Seble Metaferia, Serawit Tasew, Dereje Bekele, Bekele Legese, Hussen Adem. Front: Tumicha Tuna, Sintayehu Tamene, Zerfu Jomba, Ejigayehu Mengesha, Shura Hujawa, Gabrehiwot Woldeyohanis, Meseret Worku, Tamirat Gelaye, Mulugeta Lele, Yohanis Erdachew, Zegeye Tsega. Not on the photo: Sintayehu Tsige, Habtamu Elias, Justin Donnelley, Ute Schmiedel. 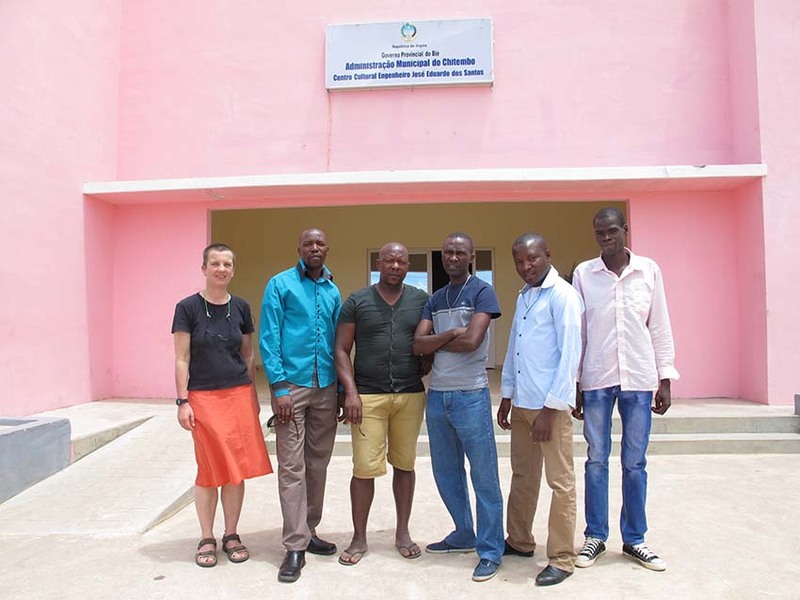 The forth training workshop for the paraecologists of The Future Okavango project is taking place in Chitembo, Bie / Angola from 16th to 28th March, 2015. The main objective of the training course is to produce short films to share the TFO research outcome with local stakeholders at the three core research sites of the project. 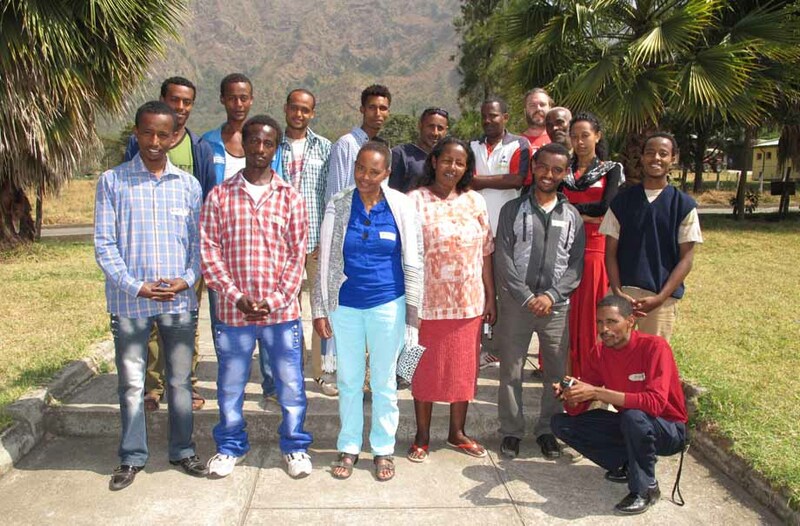 ARBONETH (ARBOPRO-NETWORK-ETHIOPIA), an initiative funded by the German Academic Exchange Service (DAAD), develops a paraecologist programme at the Wondo Genet College for Forestry and Natural Resources of the Hawassa University, Ethiopia. The paraecologists will support scientists and ensure that their local knowledge will be integrated into the academic research. 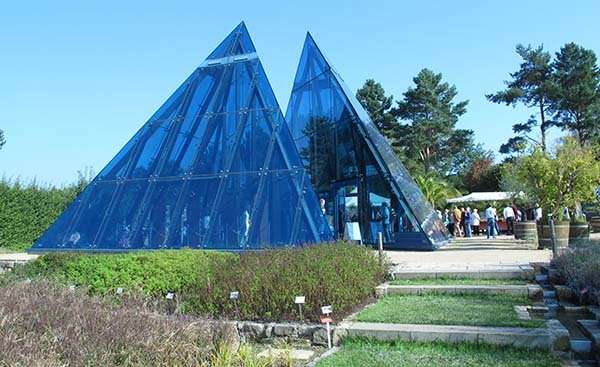 The paraecologist programme will be implemented in collaboration with the University of Hamburg. Paraecologists during a training workshop in Wondo Genet in 2014. The paraecologists Meshack Kwamovo and Robert Mukuya of the Future Okavango Project (www.future-okavango.org) attended the Arid Zone Ecology – Thicket Fusion Forum in Grahamstown, South Africa, from 8 to 11 September 2014. They presented a poster and a talk on Science – Community Communication, which were both very well received by the audience. As a result of his relevant and well-presented talk, Meshack Kwamovo was requested by the conference organisers to address the Head of Department of Economic Development, Environmental Affairs and Tourism of the Eastern Cape, Mr. Bongani Gxilishe, and the participants of the conference on the question “How to master the science – community communication?” during the Gala Dinner at the end of the conference. 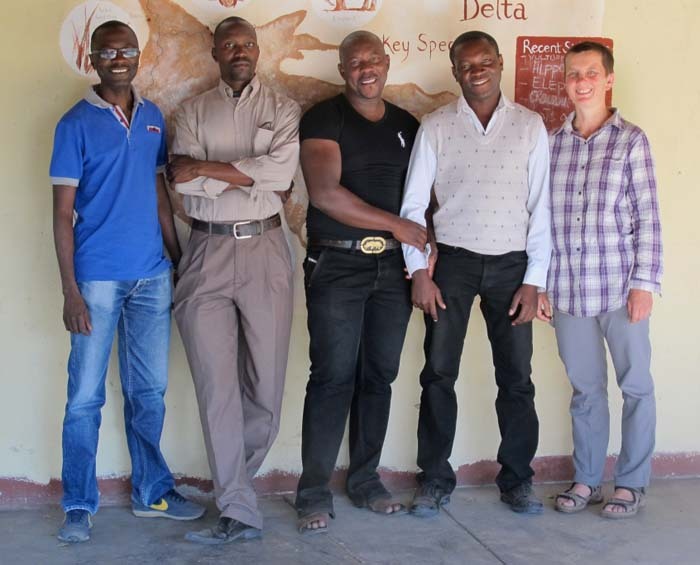 The third training workshop for the paraecologists of the Future Okavango project is taking place in Mashare, Rundu / Namibia from 28th of July to 8th of August 2014. The main topic of this training is how to share scientific results of the Future Okavango project with local stakeholders. 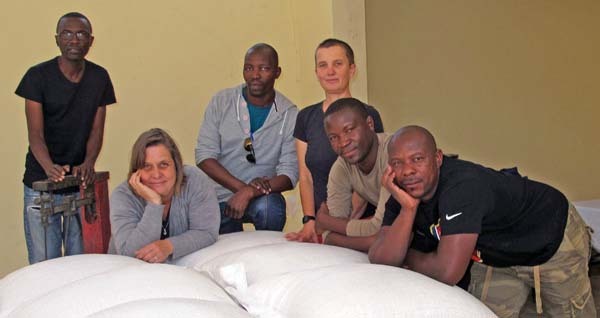 Participants (from left to right): Vilho Snake Mtuleni (Namibia), Bettina Koelle (South Africa), Meshack Kwamovo (Botswana), Ute Schmiedel (Germany), Miguel Hilario (Angola), Robert Mukuya (Namibia). A training school on Participation Driven Science in Ecology and Hydrology: Implementation of paraecology in dryland research and restoration was held at the Botanical Garden of the University of Hamburg, Germany, from 17-19 February 2014.The training school aimed to explore the role of paraecologists in the sustainable management of drylands and restoration of degraded land. The training school formed part of the EU COST Action ES1104 “Desert Restoration Hub” and was open to PhD students and Postdocs who work in the field of restoration and monitoring of dryland ecosystems and who are interested in learning about approaches for integrating local stakeholders through the involvement of paraecologists. 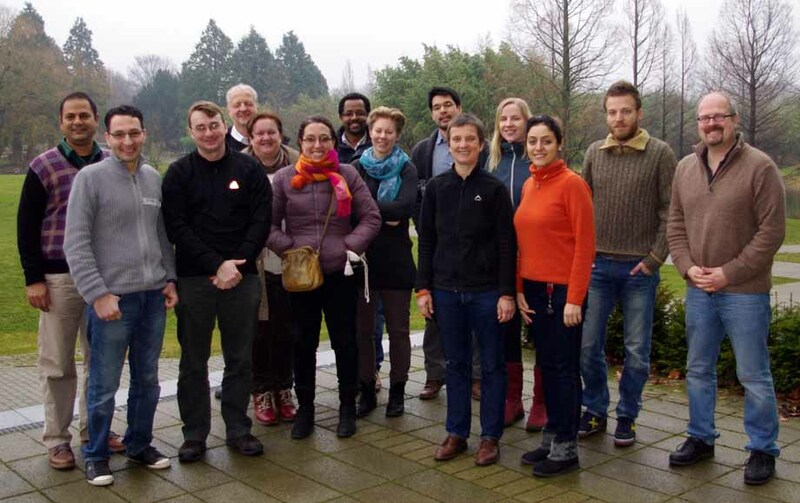 Participants (from left to right): Shekhar Kolipaka, Kamal Zurba, Nathan Forsythe, Steffen Niemann, Ieda Maria Bortolotto, Maria Fantappiè, Yoseph Araya, Matilda Palm, Marc Parfondry, Ute Schmiedel, Linda Böckenhoff, Naghme Gholami, Athanasios (Thanos) Smanis, Christoph Külls. 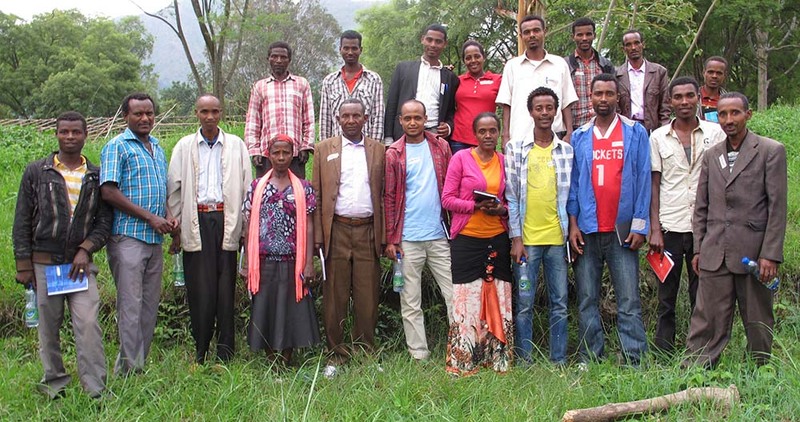 From 20th to the 24th of January 2014, a paraecologist training workshop was held at the Wondo Genet College of Forestry and Natural Resources near Shashemene in Ethiopia. The trainees, mainly local tour guides but also college staff, were interested to get involved into future research and maintenance activities around the Wondo Genet College Arboretum. The paraecologist training comprises topics like plant biology, plant identification, and taking photos of plants. The workshop forms part of the ARBOPRO project of the University of Hamburg. For more information about the training course contact Ute Schmiedel Ute.Schmiedel@uni-hamburg.de. From 28th of October until 1st of November 2013 eighteen Groen Sebenza paraecologists from the Eastern, Western and Northern Cape Province of South Africa participated in a training workshop held in Grabouw / Western Cape Province of South Africa. The paraecologists are working for 2.5 years with various institutions and organisations in rural areas or small towns where they are involved in biodiversity assessment, monitoring and management. The workshop included topics like professional performance at the workplace, conflict resolution, reporting, facilitation of meetings and workshops, time management, budget management, team building but also the use of GPS, the taking of plant photos for scientific purposes, the value of scientific names for plants and animals etc. Groen Sebenza is a Jobs Fund Partnership Project that aims at developing priority skills in the biodiversity sector to create sustainable job opportunities for 800 unemployed graduates and matriculated students (for more info go to www.sanbi.org/programmes/education-hcd/groen-sebenza). 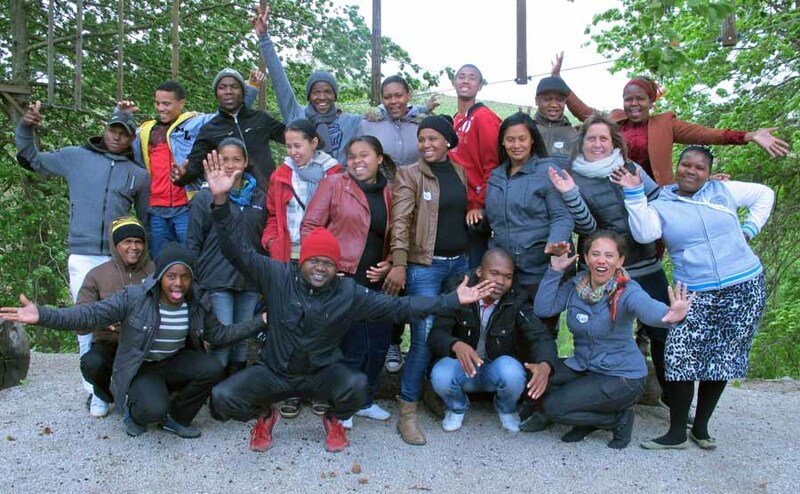 Eighteen of the Groen Sebenza matriculated students participated in the paraecologist training workshop. 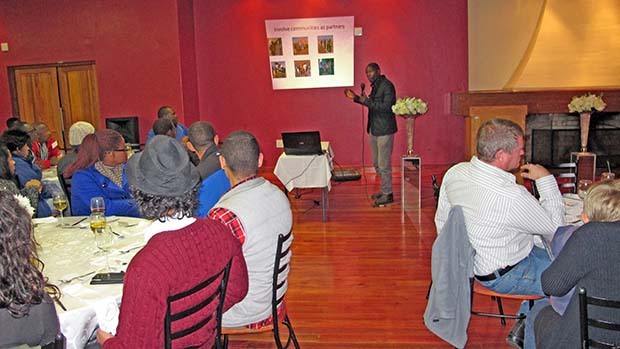 The training was focussed on the objectives of the Future Okavango project, climate change, and application of computer programmes. The first training workshop for the paraecologists of the Future Okavango project is taking place in Mayana, Rundu / Namibia from 7th to 17th of August 2012. 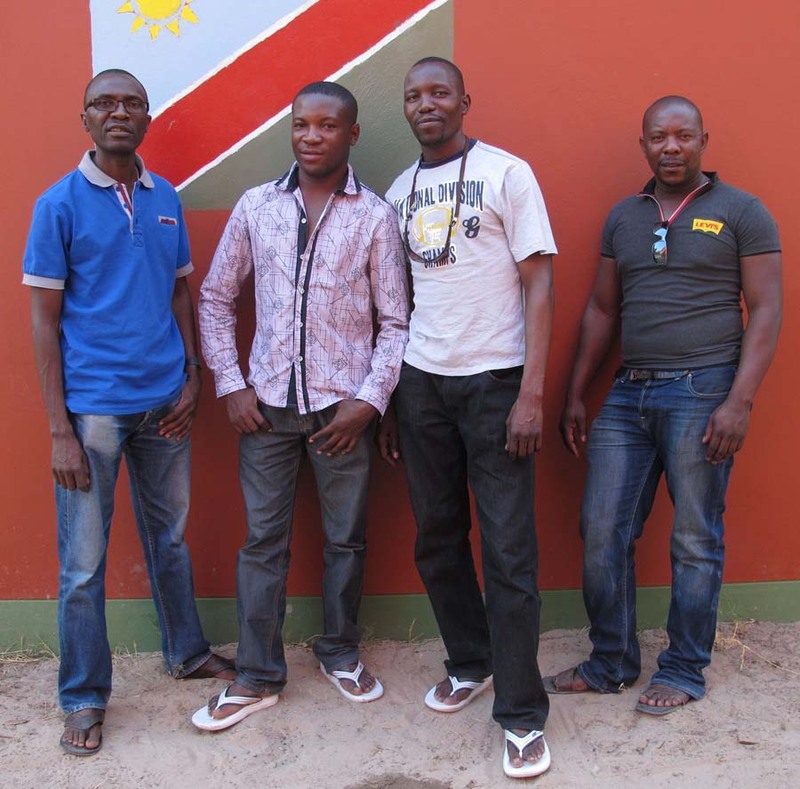 Vilho Snake Mtuleni (technician, Namibia), Miguel Hilario (Angola), Meshack Kwamovo (Botswana), Robert Mukuya (Namibia). 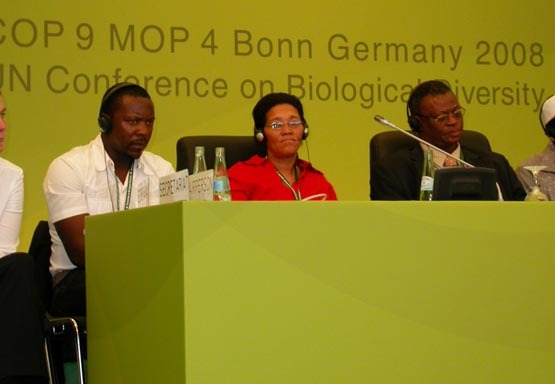 Robert Mukuya, Namibia (left) and Marianna Johanna Lot, South Africa (center) were invited as BIOTA paraecologists to present the visions of African stakeholders on the Biodiversity Convention from the paraecologists' perspective.